If you fancy having a go at making hot cross buns, I have this recipe for hot choc buns, which is a really good one. So what makes these pancakes, hot cross bun ones? It’s the addition of raisins and the holy trinity of Easter spices – cinnamon, cloves and nutmeg. They really do taste like hot cross buns and they’re a whole heap easier and quicker to make. I make them with wholemeal spelt flour, which is my favourite flour for baking. They should, however, be fine with whatever wholemeal flour you have to hand. You can use the milk of your choice, but I find kefir, buttermilk or watered down yoghurt give a better result. I tend to use kefir as I usually have plenty of it to spare. Kefir is incredibly good for you and really useful for baking as well as smoothies or just drinking on its own. If you fancy a go at making your own, I have a post explaining just how to do it. Despite only adding one teaspoon of sugar, the pancakes are irresistibly sweet. It’s those flavoursome raisins doing their thing. The pancakes are so delicious when they have just been cooked, that I find it very hard not to just scoff the lot straight away. If truth be told, they’re so good, they don’t really need the chocolate sauce. But it is Easter and chocolate is mandatory. This dairy-free chocolate sauce is really simple to make. It’s also really scrummy; you wouldn’t know it was pretty much just chocolate and water. The key to this chocolate sauce is to use the best quality dark chocolate you can afford. There are no other flavours to mask those coming from the chocolate. For occasions, like Easter, it’s worth pushing the boat out a bit. I used a bar of Nicalizo 72% dark chocolate from Chocolate Naive. This is a bit of an elusive brand, but well worth tracking down if you’re a chocolate connoisseur. Once the sauce is made, drizzle a cross on top of each pancake or pancake stack – the choice is yours. 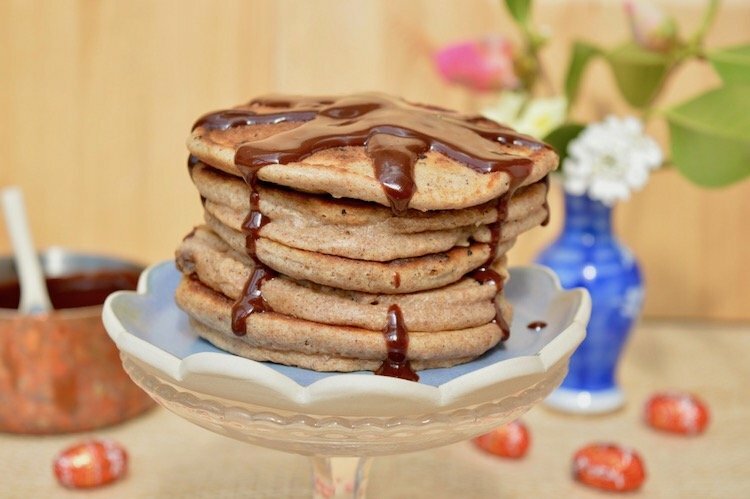 You can find several recipes for chocolate sauce on Tin and Thyme. If you don’t like the idea of this one, just choose one of the others to serve with your hot cross bun pancakes. For more Easter recipe inspiration you can take a look at my Easter archives. Alternatively, head over to my Easter Recipes and Ideas Board on Pinterest, where you’ll find loads. Thanks for visiting Tin and Thyme. If you make these hot cross bun pancakes for Easter, or any other time, I’d love to hear about it in the comments below or via social media. Do share photos on your preferred social media site and use the hashtag #tinandthyme, so I can spot them. For more delicious and nutritious recipes, follow me on Twitter, Facebook, Instagram or Pinterest. 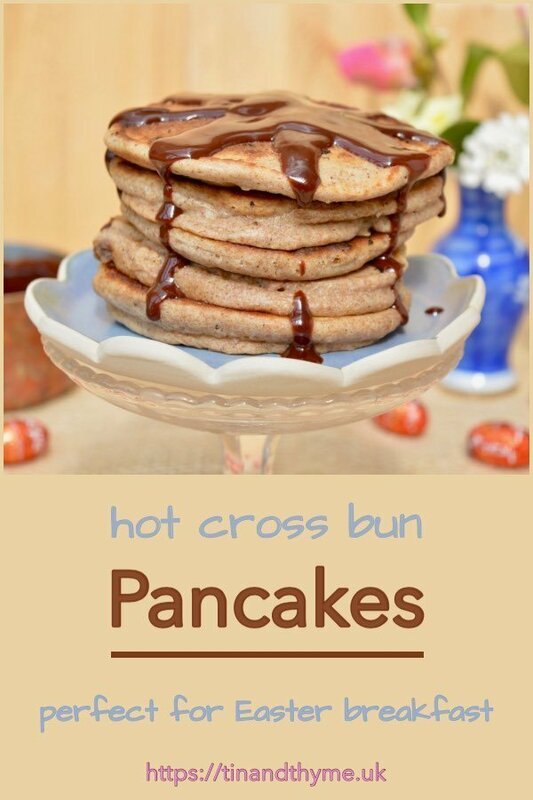 Hot Cross Bun Pancakes. PIN IT. 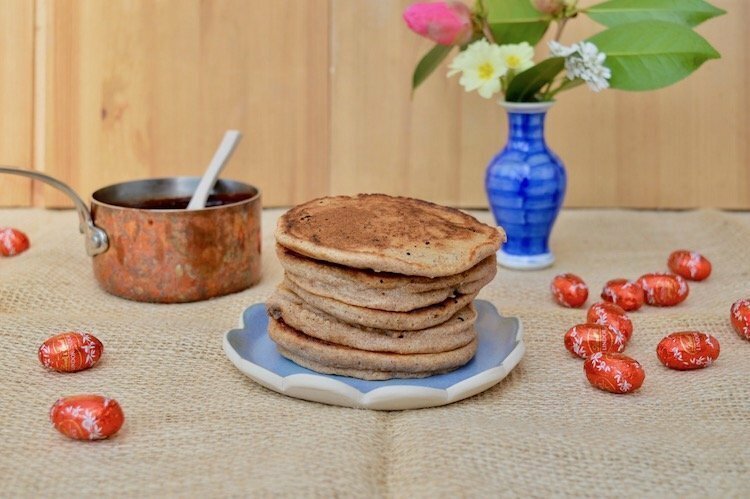 These hot cross bun pancakes are studded with raisins and redolent with Easter spices. Serve with or without an easy, yet luscious chocolate sauce. Place the dry ingredients into a large bowl and whisk together. Add the raisins and whisk again. Make a well in the centre, break in the egg and add the kefir. Whisk together, then add the melted butter and whisk again. Leave to stand for a couple of minutes whilst you make a start on the chocolate sauce. Heat a large non-stick frying pan on a medium heat. Just coat the surface with the butter or oil. Place heaped tbsp of batter into the pan and form into rough circles. Turn down the heat slightly, so it's medium low rather than medium high and cook until you see bubbles start to form on the surface of the pancakes - about 3-4 minutes. Flip the pancakes over and cook for a further 2-3 minutes. Either serve immediately, or cover the pancakes with a tea towel to keep them warm and to stop them drying out whilst you finish cooking the rest. Roughly break up the chocolate and place in a small pan together with 75ml water and the other ingredients. Set over a low heat, stirring occasionally until the sugar has dissolved and the chocolate melted. Don't worry if it's a bit lumpy at this stage. Crank up the heat a little until the mixture is bubbling lightly. Cook for 3-4 minutes, stirring occasionally, until the sauce is smooth, thick and glossy, but still pourable. Pour over the freshly cooked pancakes whilst still warm. Cooking time will depend on how many pancakes you can fit in a pan. A normal size pan will fit 3 to 4. Please note: calories are per pancake. They're approximate and will depend on serving size and exact ingredients used. 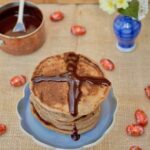 I’m sharing these Easter hot cross bun pancakes with Apply to Face Blog for #BakingCrumbs and Lost in Food for #CookBlogShare. Such a great idea! I love the warm spices in them. Thanks Angie. They are good the next day popped in the toaster, but definitely best when just made. I love using the flavours of hot cross buns in different bakes. Like you said hot cross buns can take some time to make but the flavours are delicious! I love homemade hot cross buns and was planning on making some this year, but what with one thing and another, it’s sadly not going to happen. These pancakes make for a pretty good substitute though. 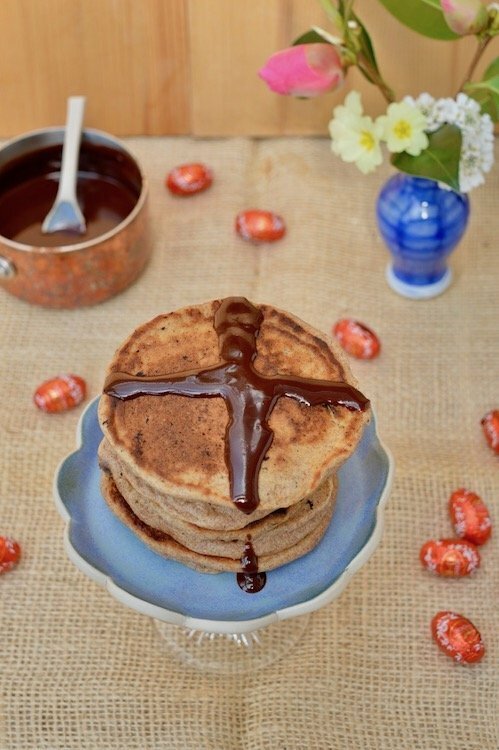 Adore the look and sound of these pancakes, Choclette. I’m like you – each year I plan to make hot cross buns (like for tomorrow) but I’ve missed my opportunity already! This sounds a super idea and delicious too. They look delicious! I love Hot cross bun flavours in anything! What a great idea, they look delicious! I would never have thought to combine those flavours in a pancake. I must admit I’ve never made hot cross buns from scratch – too much forward planning for lazy-baker-me! Never fear Jo, this pancakes are a pretty good substitute and can easily be made last minute. I’ve just made a pile of these for some surprise visitors. Really tasty, just as good as buns, I think! I didn’t do chocolate sauce as I had no chocolate – I know, I know but, I don’t like chocolate so only buy it for others – but I served them with some lovely local chestnut honey. These are excellent, I shall certainly make them again. Woohoo, glad you liked them Isobel. We decided they really didn’t need the chocolate sauce, they were good just on there own. I do like the idea of having them with chestnut honey though. Happy Easter. Yay! I do hope you enjoy them. Happy Easter. Haha love it Choclette. You did make me smile. I’d happily tuck in. Sharing! Thanks Jac. I’d happily tuck in again too. They are delicious.